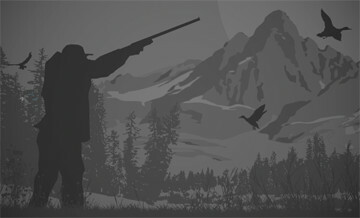 Merriam’s turkey range is scattered all over the West. It’s original home range is believed to be in the Rockies, including Colorado, Arizona and New Mexico. However, it has also been introduced to other states, such as South Dakota and Nebraska. Merriam turkey hunting offers typically begin at just over $1,000 and may reach $2,000 for hunts on well-stocked private lands. When to hunt Merriam S Turkey? Spring turkey hunting season in states with Merriam’s turkey populations typically runs from mid-April to late May, but may start as early as in late March in some states (e.g. Nebraska). Fall season varies greatly from state to state, but you can usually count on October and November. The biggest challenge of Merriam’s turkey hunting is the wide open spaces the birds favor. That means more ground to cover in search of birds, and less cover to hide the hunters from their all-seeing eyes. Scouting the evening before the hunt, with the aim to locate the birds at their roosts (with the help of “locator calls” such as coyote or owl hoot that make turkeys respond with alarm cries) is essential. If you have never hunted Merriam’s turkey before, it’s best to hire an experienced guide. Merriam’s turkey is nearly as big as the eastern turkey, but typically has smaller beard and spurs. It has unique light colored plumage, and even more unique habits - it’s more adapted to living in wide open spaces than other turkeys. The Merriam turkey gobblers are said to be more aggressive and defensive of their territory than other subspecies, and would come to the call more readily. This offers an unforgettable hunting experience, and adding a Merriam turkey to a turkey grand slam is typically only an excuse for those who love to travel and hunt the amazing landscapes of the American West. Our wild Merriam’s cross turkey are a five way cross producing a really big hybridized turkey. There are plenty of longbeards strutting around and they can be easily heard gobbling. We have prime spots to hunt Nebraska Merriam’s cross turkeys. Open grassland and tree lines offer many hunting opportunities. We have some of the best land for turkey hunting in Nebraska. Our movable ground blinds are available for an incredible hunting experience. We offer a 4 night/3 day turkey hunt. Hunters arrive the day before they begin their hunt. While you are staying at our beautiful cedar log lodge, you will be able to take advantage of great fishing between peak hunting times. Our 20 acre boomerang lake is stocked with large-mouthed bass, northern pike, bluegill, catfish, and crappie. Hunting license and permits can be purchased at www.outdoornebraska.gov for Pawnee County, Nebraska.